A recent study suggests that the American Southwest may be more likely to undergo a decade long drought within the next hundred years. The study, by Toby Ault of Cornell University, states that decades long droughts have happened in the past for unknown reasons. The records of these droughts comes from tree rings (which are narrower if the tree that year grew under drought conditions). Much of the American Southwest is already in drought conditions, with California and Arizona suffering unusual dryness. 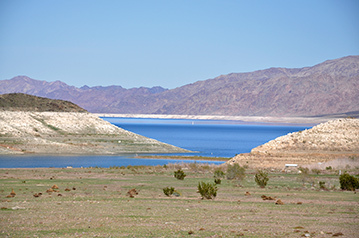 Lake Mead, the great reservoir behind the Hoover Dam, is at historically low levels as seen below. So if there is not enough water to continue the current lifestyle and agricultural productivity of the desert Southwest from irrigation, what can be done? Some places, like San Diego, are experimenting with desalination of seawater to make freshwater. This is not practical for much of the Southwest interior states, or even states like Arizona (which famously lacks ocean front property). Because of the obvious presence of rivers and streams, it is forgotten that there is over six times more fresh water in the air than in rivers. There is also more water available in capillary water (not ground water in the traditional sense) in the soil than is available in rivers and streams. When the location of fresh water becomes more evident (air and soil moisture stored as capillary water) the question quickly becomes - how do we access this water? An inventor and Dutch flower breeder by the name of Pieter Hoff also had this question. He retired from his flower business, spent 7 years and 7.1 million dollars developing a device to access this water. His invention is called the Groasis Waterboxx. The Groasis Waterboxx is a self recharging water battery for trees and other compact plants, It is filled initially by a person, and the soil underneath it is moistened. The Waterboxx then collects dew and rainwater, stores it in a fifteen liter reservoir, and slowly releases it to the roots of a growing plant. The Waterboxx never needs human refilling after initial set up. The Waterboxx encourages the roots of the tree to reach for deeper capillary water by creating a vertical water column. This is directly opposite of traditional irrigation which encourages shallow root growth by releasing large amounts of water to only the top layer of soil. Shallow roots are then more likely to dry out quickly once the irrigation water is stopped (due to drought). After the tree reaches this water (and becomes self-sustaining), the Waterboxx can be removed and reused for up to 10 years. Dew Harvest® LLC was started in the United States to help promote the Groasis Waterboxx. We truly desire to see new forests, vineyards, and orchards planted across the drier parts of our nation. With drought currently evident in much of the country and increasingly likely in others, it is clear that the time for the Groasis Waterboxx has come. Be the first in your area to start growing trees and other plants with the Groasis Waterboxx. Buy the Waterboxx today. You can see all our blog posts about planting trees with the Waterboxx here. We would love to hear your comments below - to leave one, please click on "Comments".